A new pair set the etch their name on the roll of honour; at 2018 ITTF Challenge Belgosstrakh Belarus Open in Minsk, on the afternoon of Sunday 18th November, in the Men’s Doubles final, the verdict went in favour of the previously tried combination. 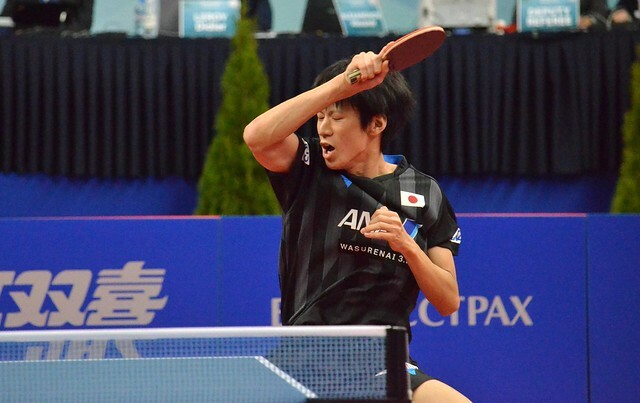 Both partnerships having been required to compete in the qualification tournament, it was Japan’s Kakeru Sone and Yuta Tanaka, runners up just over three weeks earlier in Belgium, who prevailed. They beat the hitherto untried combination of Ukraine’s Kou Lei and Croatia’s Wei Shihao in three straight games (11-7, 11-9, 13-15, 11-7). Both shake-hands grip players, the combination of the right handed Kou Lei alongside the left handed Wei Shihao made the better start to proceedings. They established a 4-1 lead in the opening game but at 5-all matters were level, as the Japanese duo adapted the situation; Kakeru Sone and Yuta Tanaka surrendered just two more points, thus the opening game was secured. Assured, the more consistent pair, in the second game Kakeru Sone and Yuta Tanaka, from parity at 3-all, established an 8-5 lead only to lose the next four points. It was a major opportunity for Kou Lei and Wei Shihao, it was not taken, the next three points all went the way of the Japanese duo. Kakeru Sone and Yuta Tanaka held a valuable two games to nil lead. In the third game, as in the second, matters were level at 3-all and again at 9-all as one pair established a one point lead and then the other, neither partnership able to establish a clear advantage. At 10-9, there was another opportunity for Kou Lei and Wei Shihao. Again the chance was not taken before, at the fifth time of asking, Kou Lei and Wei Shihao converted to reduce the match arrears to one game. A boost of confidence, in the fourth game, Kou Lei and Wei Shihao established a 4-2 lead but at 6-all it was parity. They were never able to regain the advantage; at 10-7, Kakeru Sone and Yuta Tanaka held three match points, at the first attempt they converted. It was the top step of the podium for the Japanese duo, one step higher than in Belgium.